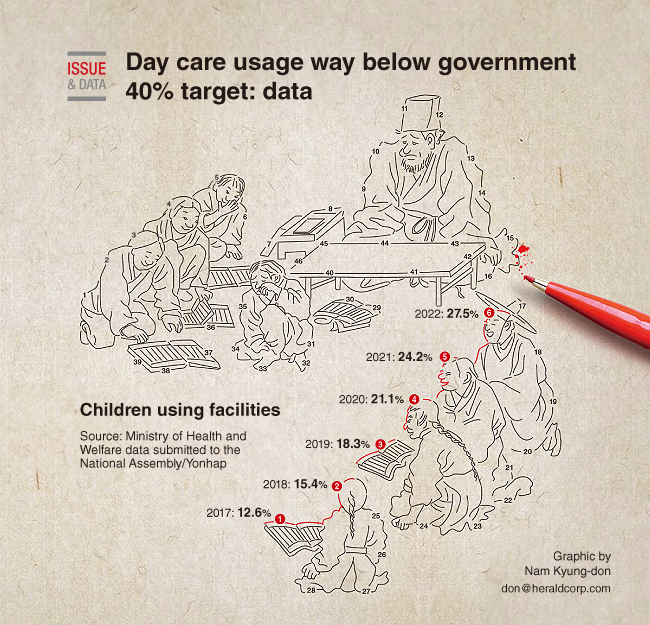 The proportion of children using national and public kindergartens and child care centers is expected to remain far short of 40 percent, the government's target, official data showed. President Moon Jae-in earlier set a goal to expand government support for parents with young children, vowing to more than triple the proportion of infants and toddlers looked after by publicly run centers within his term in office. As part of the effort, the government increased the number of centers by 373 in 2017 and plans to build 450 new centers each year over the next four years. The latest numbers, however, showed only 12.9 percent of those eligible using such facilities as of the end of 2017, with figures likely to go up to 15.4 percent in 2018 and reach around 18.3 percent in 2019. This is further estimated to rise to 21.1 percent in 2020, 24.2 percent in 2021 and 27.5 percent in 2022, according to the Ministry of Health and Welfare data submitted to the National Assembly.